With the invisible ink marked cards becoming popular, more and more people have interest in the invisible ink for marking playing cards. Where to get the cards marking ink? And how to use such ink for poker cards? In addition to marked cards, we provide also infrared ink for poker cards here. You can get the invisible ink easily to make your own unique marks on your decks. You can write marks on the paper or plastic cards. UV and IR invisible ink are available now. The marks written by hands are different from those marked by machine. Hand-made marks can only last for hours while those made by machine can even keep for 1-2 years. It is a kind of special invisible ink, which is used to mark playing cards or any other paper Items. 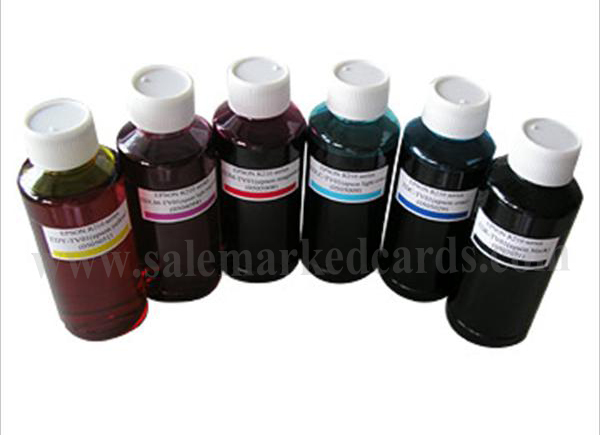 Applying a little ink on the surface of cards, and you can wait until it gets dry. Then you will see the marks you made personally with our special contact lenses or sunglasses. Usually our invisible ink is sold in pens for they are easier for shipping. What's more, the invisible ink pens are quite easy to use and you can just use it to write like a normal pen. The bottles of ink is available and it's better if you can come to pick.